Lurking within our genome are short segments of DNA, called transposable elements, which are capable of “jumping” from one place to another. These “jumping genes” have a double-edged effect, both affecting the stability of our genome, as well as shaping evolution. Understanding exactly what these effects are, and what the evolutionary response has been, is still an active area of research. In a paper published in PLoS Biology, the research group of Erin Kelleher, assistant professor of biology, describe a gene, called bruno, which moderates the harmful effects of transposable elements, a response called tolerance. Co-authors on this paper include four University of Houston undergraduates. 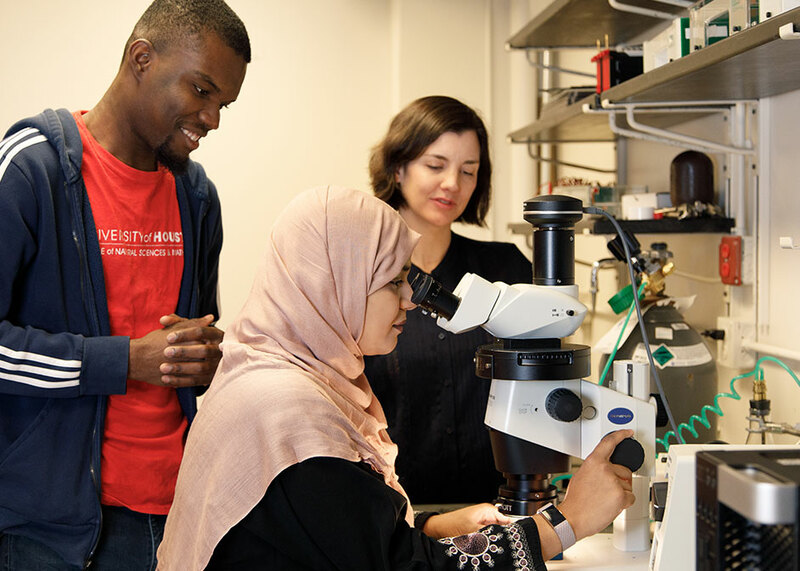 These results are the end product of years of hard work, which included the efforts of UH undergraduates Jaweria Jaweria, Uche Akoma, Lily Ortega and Wenpei Tang, doing research in the College of Natural Sciences and Mathematics. When faced with the invasion of a transposable element, there are two different ways for a genome to adapt. The first is resistance, which suppresses transposable element activity by controlling replication. Although these transposable elements are found within the genome, they are kept quiet, their activity suppressed. The second adaptation is tolerance, in which transposable elements are active, but the harmful effects are reduced. An analogous situation in humans would be a person who has active levels of a virus, but does not display symptoms. The most famous example was a cook Mary Mallon, nicknamed Typhoid Mary, an active carrier of typhoid fever who infected countless numbers of people, although she displayed no symptoms. Most of the known adaptations are through the mechanism of resistance. Tolerance is a less understood phenomenon. The biggest challenge to studying tolerance is finding populations which lack resistance. To address the mechanism of tolerance, Kelleher’s research group took advantage of a transposable element known to have invaded Drosophila populations. Called the P element, this transposable element invaded wild Drosophila populations about 50 years ago. Since then, the P element has spread to all Drosophila in the wild. However, given that Drosophila has been studied in laboratories since the start of the 20th century, some lab strains have not developed resistance. Using these strains, Kelleher and her group were able to perform a genome-wide screen, looking for variants with increased tolerance to P elements. Kelleher and her group screened 32,000 flies. They found a gene, called bruno, which is linked to tolerance. Experiments show that mutations within this gene, along with different levels of expression, affect tolerance.